It's been such a busy Advent, I didn't start on the eight presents until this week and only managed seven before TIME PLEASE. Oh well don't cry for me Argentina, as you can see, I am being like the person who lines up at the 15 items or less checkout because seven yogurts counts as one item, right? 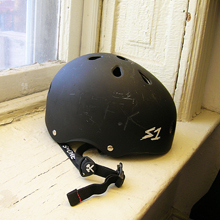 S-One Lifer helmet - The snap on my hockey helmet broke again, so I ended the hockey helmet experiment. My conclusion: hockey helmets are okay. They're not perfect for derby. I love my new helmet, it's the S-One Lifer and they fit you for your basic size and then let you try on the shell with different-sized front, back, and top liners for a custom fit. Because I wear a bandana, I have a L shell with L liners, sort of boring, but it fits good. Review TK, but there's not much more to say than that! Bloc and Bounce toe stops - No, I did not need two pairs of toe stops. I couldn't decide! As you can see, the Bounces have bounced out of their box and are on my skates as we speak. Reviews TK! 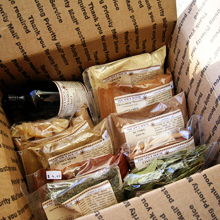 Spices - I originally wasn't going to count this as one of the eight, but why not. When I lived in Madison, I discovered Penzey's and now I get my spices from The Spice House, which is the same family, and which is a quick trip on the North Avenue bus to Wells. The price is surprisingly cheap for the really high quality, the only expensive thing was the vanilla, which was (ulp) $15.99, but everything else was around $4 for a 4 oz bag. What gets you is waiting to get your spices measured out, it doesn't even help to close your eyes because you can still smell everything. On the savory side I got cumin, coriander, and chili powder for my carne asada and carnita, plus thyme for chicken soup, it turns out the that sweetie man likes my chicken soup, so I will make him that all winter. On the sweet side I meant to just get cinnamon and nutmeg, but I also got ginger—for sprinkling on pears before roasting, yes?—and also cinnamon sticks and bay leaves for my mulled wines and ciders, tch, I should have gotten whole cloves, too. And whenever I go to the spice store, I get the sweetie man a little bag of candied ginger because he likes them. Space cadets - Odie and his pals are just holding this space here. Tissue tees - Biggie spied these out at Target, I was looking for the exact same Xhiliration tissue tees that I bought ...ten years ago. These are close enough, tissue is the salient feature. Nice underlayer for work outfits. 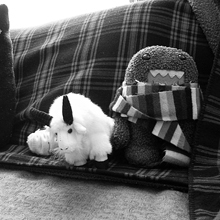 I wanted black, charcoal grey, and navy; they had black, heather gray, and white. Mehhh, should I have gotten white? Except for playing as a Fury, I don't think I ever wear white. 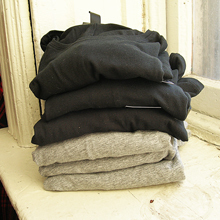 I'm toying with the idea of getting white and dying them navy, and dying the heather gray charcoal. 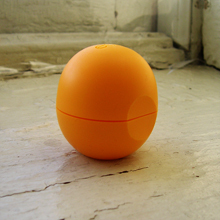 Eos lip balm - Eeee! I have wanted one of these for a while. I may not wear a lot of white, but I make up for it in orange! Everything orange! 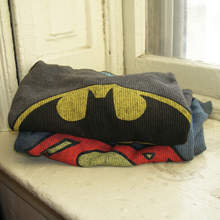 Bats and Supes long sleeved thermal t-shirts - Total impulse purchase while waiting in line at Old Navy. Fuzzy socks - Now that I work three days a week, I needed a couple more pairs of black fuzzy socks to satisfy my formula (n x 2) + 2 equals eight total. 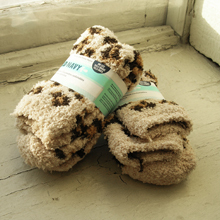 But, Old Navy was sold out of black fuzzy socks. They had cheetah print though, haha, okay. Eight Presents 2013: Where Are They Now? Still wear this for biking. I didn't end up liking the bounces, the blocs I loved. Retired now, though. I think these all got used up. I will need more vanilla soon. Aw, this was before Kevin. This one melted, but I have three others.